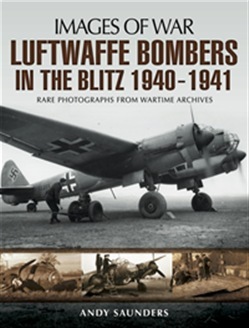 Luftwaffe Bombers in the Blitz will comprise of some 140-150 images of German bomber aircraft during the Blitz of 1940-1941. The images will cover the entirety of the Blitz and will also depict losses across Britain during this period. Each picture will tell its own story, and will be fully captioned with historical detail. Each section will have a short introduction and the images will include those of shot down aircraft, including relatively intact machines, badly damaged/destroyed wreckages, photographs of pilots and other related illustrations. All images are from the author's unique collection of wartime photographs of Luftwaffe losses, collected from a variety of sources across some thirty-five years of research. Acquista Luftwaffe Bombers in the Blitz 1940-1941 in Epub: dopo aver letto l’ebook Luftwaffe Bombers in the Blitz 1940-1941 di Andy Saunders ti invitiamo a lasciarci una Recensione qui sotto: sarà utile agli utenti che non abbiano ancora letto questo libro e che vogliano avere delle opinioni altrui. L’opinione su di un libro è molto soggettiva e per questo leggere eventuali recensioni negative non ci dovrà frenare dall’acquisto, anzi dovrà spingerci ad acquistare il libro in fretta per poter dire la nostra ed eventualmente smentire quanto commentato da altri, contribuendo ad arricchire più possibile i commenti e dare sempre più spunti di confronto al pubblico online.